No, it wasn’t what was going through my mind. Brazil has many big problems, but it also has an amazing culture, fantastic people, and unbelievably beautiful places. This is why I really want everyone who goes there to have a great experience: I want my country to give its guests all the goodness it has to offer. I have friends and clients who saved money for a very long time to be in Brazil for the World Cup. It is my wish that they have an unforgettable experience. I want them to meet incredible people. I want them to experience the fun and joy of being a part of a crowd while watching Brazil play. It is so much fun. Check out the video below. 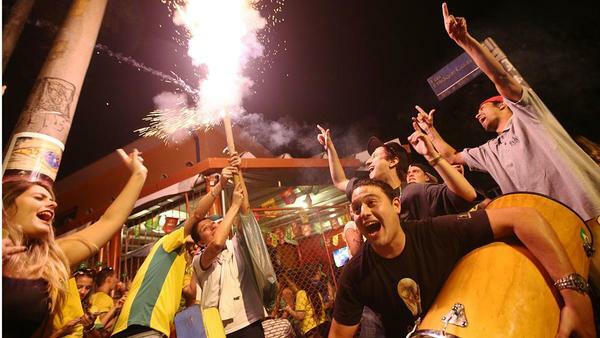 It shows a strangely quiet São Paulo during a World Cup game, and what happens when Brazil scores a goal. Look at the faces of these Brazilians in the picture. I got this picture from a very good article that describes the mixed emotions that the World Cup has been stirring. I want my friends and clients to eat delicious food, dance to great music, see beautiful places, and experience the Brazilian culture. There are things in our culture that you cannot just read about it, or even study it. You have to live it. Vamos, Brasil! Let’s play beautifully and give our friends an unforgettable experience. Schedule your Portuguese Trial Lesson.